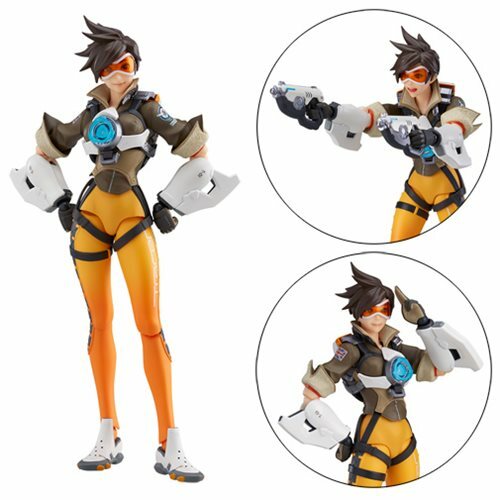 From the globally popular multiplayer first-person shooter Overwatch comes a Figma of Tracer! The smooth yet posable Figma joints allow you to act out a variety of different scenes. A flexible plastic is used in specific areas, allowing proportions to be kept without compromising posability. Tracer comes with 3x face plates, including a smiling face, an excited expression, and a serious, confident expression. Optional parts include her trusty Pulse Pistols as well as a Pulse Bomb to display her using her ultimate ability. Also included is an articulated figma stand to facilitate various exciting poses. Tracer is made of quality plastic, stands about 5 1/2-inches tall and comes packaged in a sleek window box.